The GGW prediction of many months ago, that Manuel Pellegrini would be sacked at the end of the season whether or not he won the league, finally came true on Wednesday night. The events of the evening allowed Pellegrini to show his inherent dignity and decency but they also demonstrated some of his weaknesses and offered a final proof that very good coach as he is, the Real Madrid job was never the right one for him. All the press hysteria of the past week about the imminent arrival of Mourinho to the job that was still technically his must have been hurtful to the proud Chilean even though, as GGW reported last week, he had the consolation of a very large cheque stuffed down the back of his trousers. On Wednesday night Pellegrini looked happier than he has for months. Ever since the October 4-0 Cup defeat by a third division team he has looked more and more haunted and hunted, with a growing form of glassiness around the eyes that have been a gift to the crueller Marca cartoonists and caricaturists that have lampooned him mercilessly for the past 7 months. It was in the comments that Pellegrini made in his subsequent interviews that he revealed, probably unintentionally and unwittingly, those traits of his personality that made him unsuitable for such a robust role as the Real Madrid coach. First of all he made it clear that he had wanted to keep Sneijder and Robben but others had made the decision that they should be released. Pellegrini showed no awareness of the point made by GGW in its post “Pellegrini’s big mistake” that he could and should have fought to keep them and made it a power play with threats of resignation. He revealed how far such a confrontational strategy was from his basic personality by explaining how he had not had a single conversation with his President since his brief initial one on being appointed. Pellegrini said “The coach should have had a more important voice in what the team needs. At that point I felt small” but he displayed no awareness that he had quietly colluded in that isolation rather than challenging it. One cannot imagine a Ferguson or a Wenger, or a Benitez and certainly not a Mourinho ever being so quietly collusive in his own isolation and powerlessness. At Villarreal Pellegrini showed what he could achieve working together with a President and a Chief Executive who gave him respect and involvement if not total control. But that was because they had the sense to offer it, not because he had he forcefulness to demand it. Florentino Perez was not slow to respond to Pellegrini’s implied criticism. The next day he said with dismissive superiority that his job was to direct and manage the club, not to talk to the coach. In a masterly display of faux naivety he claimed that if he talked to his coach every 7 or 10 days he would be accused of seeking to interfere in team and selection matters, which would never be his intention. That exchange summed up well what Perez is about. He is not a football man, he has never respected any of his coaches. In next month’s World Cup one of the teams favoured to triumph will be lead by a coach he publicly disrespected, Del Bosque. Others disrespected by Perez include Portuguese national coach Queiroz and Brazil’s most successful club manager Wanderley Luxemburgo. Real Madrid legend Camacho refused to hang around to be disrespected any more than Perez managed in his first few days. Perez created the climate where even successful trophy-winning coaches like Capello and Schuster were treated badly by Real Madrid. Most great football teams are assisted by a sound relationship between Club President and Team Coach. In his aloof arrogance Florentino Perez seems to genuinely believe he can create a very successful winning team without a positive relationship with a coach. It will be fascinating to see what happens if he tries to go 10 days without speaking to Mourinho far less 10 months. 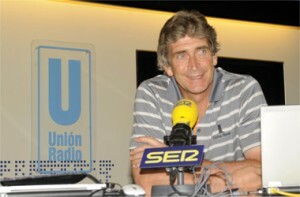 Marca continued its abominable treatment of Pellegrini past his dismissal. The rival Madrid football paper AS, no great friend of Pellegrini, did the minimum two things required, report an interview with Pellegrini and provide some kind of profile of the man and his time at Real Madrid. Incredibly Marca did neither and nothing else. There was no mention of Pellegrini anywhere until the second back page where the Marca editorial using rather twisted logic emphasised again that getting rid of Pellegrini was the act required for continuity, rather than continuity being an argument for keeping him. They didn’t mention Pellegrini’s claim that Perez had not spoken to him since August. Even with the diminished influence he was allowed at Real Madrid Pellegrini’s team achieved a best ever points tally of 96 and scored over 100 leagues goals. His league record at the Bernabeu ended up as 18 victories in 19 games. His striking partnership of Ronaldo and Higuain, preferred by him to Perez’s expensive signing Benzema, shattered the previous top scoring record held by Real Madrid legends Di Stefano and Puskas. But the bottom line, expounded by GGW in several recent posts, was he was too gentle and decent and dignified a man for the Real Madrid hot seat and his lack of a dominant personality, combined with his South American status, was used to attack and humiliate ‘El Chileno’ constantly. Just because Pellegrini does not have a dominant demanding aggressive personality but a gentle caring one, does not mean he is a soft touch for players. Ask Riquelme who despite being the Villarreal club’s best and most famous player was summarily shown the door after daring to challenge Pellegrini’s authority. Or ask Javi Venta or Marcos Senna two of the longer serving players who could only remember one time Manuel Pellegrini lost his temper at half time in his 5 seasons there. But they remember it vividly, as did their shocked team mates, who ended up winning by three goals a game they had looked to be stupidly losing. But at Villarreal Pellegrini did not rule by anger, temper or fear. He treated his players with dignity and respect, as intelligent human beings. Capdevila, the Villarreal team joker (remember the “And I suppose this one is for Busquets too” Post) went to some pains last week to emphasise that Pellegrini was not as aloof as he could sometimes appear and that he was able to relax and joke with his players while always retaining their total respect. Or ask Guti who was disciplined and dropped by Pellegrini for his unprofessional (if understandable) outraged behaviour at the 4-0 cup defeat. They made it up later and Guti performed well for Pellegrini in the second half of the season. To his credit Guti was the one Real Madrid player to publicly back Pellegrini and his worth this week. He was quoted as saying “I have only words of love for Pellegrini. He’s a great coach and I wish him well. He is a coach that should have stayed in Madrid.” The comparison with Mourinho’s comments on Guti (“Guti, he’s a dead man, he is out”) summed up the difference in personality between the two managers. 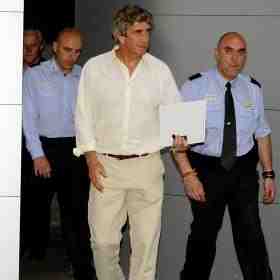 Where now for Pellegrini, off now in Chile licking his wounds? GGW believes he wants to do two more seasons in Europe before taking the job of Chilean national coach in the build up to the 2014 World Cup which is to be held in neighbouring Brazil. He does not see another Spanish club as feasible and has expressed an interest in a club in England or Italy. More than anything he wants to win a trophy. For all the miracles he performed at Villarreal he did not win a trophy for them. And we all know his spell at Real Madrid ended trophy-less, so his next job has to be one where winning a trophy is a real possibility. 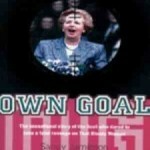 GGW wonders if the Scottish Premier League and its two cups would count as that in his eyes. With his 5million euro cheque for next year already in the bank maybe Celtic could offer enough to tempt him along with the strong prospect of domestic trophies. That Celtic should be so lucky, or visionary. GGW had originally thought there might be a three way exchange with Mourinho at Real, Benitez at Inter and Pellegrini at Liverpool. However the current Liverpool set-up is not the right one for Pellegrini (or Benitez!) given the criteria above. Maybe Moratti can show himself more intelligent than Perez by bringing in Pellegrini to Inter, giving him respect and working positively with him, while banking 16 m euros compensation for Mourinho.